During our previous Great Depression, Franklin Delano Roosevelt created the New Deal in order to put American’s back to work. The New Deal was a program that reshaped the way Americans not only interacted with the government, but with each other. FDR’s skill as a PR man enabled him to sell the public on his administration’s goals, and to reshape the notion of the public into the American public. Through his wildly successful Fireside Chats, he was able to enter into people’s homes on a consistent basis and speak to them about the serious issues facing the country. With his stirring rhetoric, he was creating a world not defined by Hollywood starlets but by ordinary, hard working, struggling families, ravaged by the current system. In one of the programs of the New Deal, the Farm Security Administration provided relief for farmers and hired photographers to document the depression. 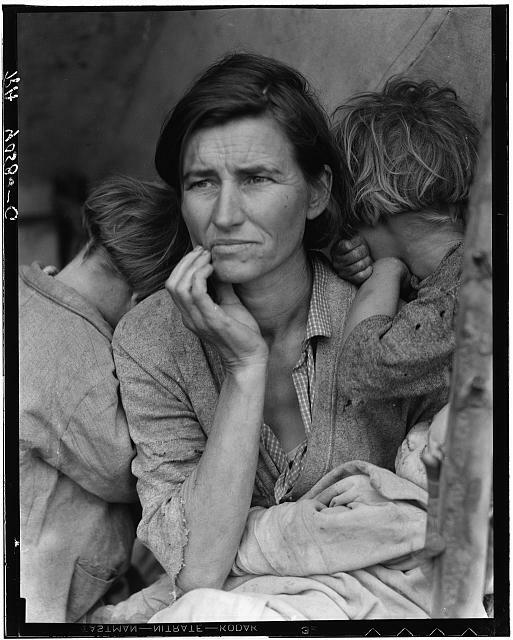 The imagery that emerged became iconic of the Great Depression and the plight of the farm workers. These images have become ingrained as Americana, as revealing the truths of those suffering during the Depression. The subjects of these photographs have come to embody the tension inherent in being a poor American. They reveal dignity and despair, hopelessness and hopefulness. The photographs, and also a few documentary films like The Plow that Broke the Plains, as the advanced media of the time, were able to introduce all Americans to the victims of the depression, or in today’s terms, showing “Wall Street” images of “Main Street”. How will this current “Great Recession” be visually realized? Will there be images that can still resonate with the American public fifty years later? There are no black and white images of worn women holding their gaze into the camera – Fireside Chats have been replaced by weekly video addresses, pictures and video are now no longer novel mediums. As a society, we are overwhelmed and over-stimulated with media. A single photograph does not have the impact it once did, as we can simply click on it and see another image, or another, or another. There are not many images that have been consistently used by mainstream media to depict the recession. With victims spread across the coasts, and not one consistent story, it has been hard to visualize the impact, although there have been images of rows upon rows of foreclosed homes. But one story that consistently has made the front pages, and nightly newscasts, and served as fodder for blogs, is the image of investment bank CEOs testifying before Congress. As the go-to scapegoats for the entire recession, CEOs were forced to take the stand and answer hours of questions from disturbed, disgruntled, and disapproving Senators. The images were usually taken from the position of the Senators, the lens angled down on the CEOs, putting the viewer in a position of power. Blogs were able to take the images and manipulate them, far easier to do with today’s technology, and usually use photos where the CEOs have particularly amusing expressions (see Daily Intel Blog as an especially good example). In thinking about American identity, is it the role of Government to help shape and unite the public? The political process has become extremely polarizing, and there is no grand PR plan to have Americans sympathize with each other. The dominant imagery has been of the scapegoats, not of the victims, as in the previous Depression. It will be interesting to see how not only the imagery of this recession, but also the rhetoric, will start changing as the mid-term elections are rapidly approaching. This semester I will be exploring these questions of identity further, in the context of politics, technology, and economic development.